This year’s fishing excursion, powered by Kawasaki Motors Canada, starts under cloudy skies as we hit Highway 15 north heading towards the upper-Laurentians. 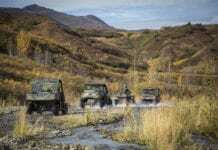 Our road-trip would eventually lead us to Beauregard Lodge, but first, we needed to pickup the units we would be using during our fishing expedition. The units were prepped and waiting for us at “Moto Falardeau”, a Kawasaki dealer located in the area on Mont-Laurier (Québec). 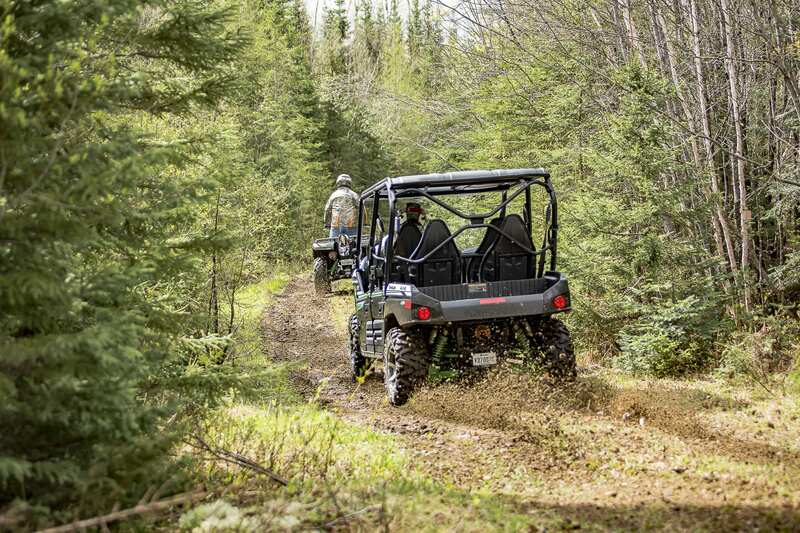 Once the 2017 Kawasaki Teryx4 LE and Bruteforce 750 SE were securely loaded on our rig, we were cursing the highway once again. We finally arrived at Beauregard Lodge in late afternoon. 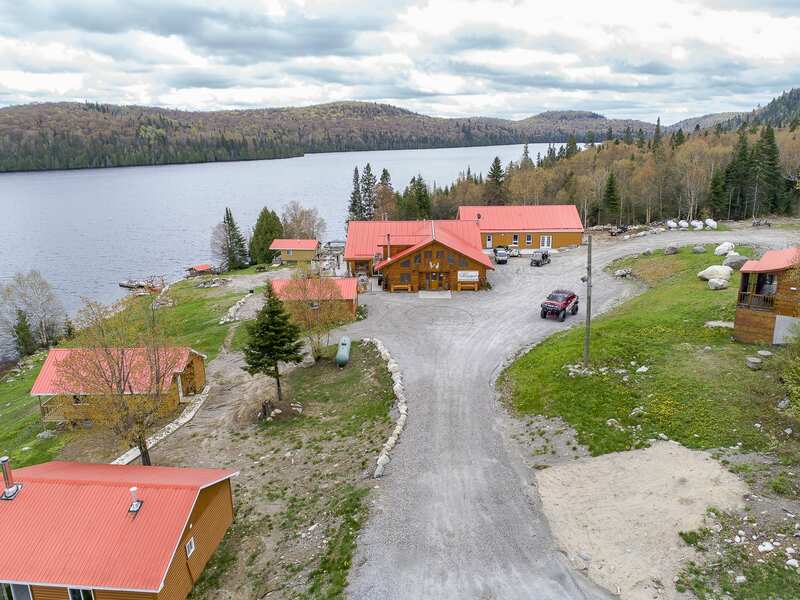 Beauregard Lodge is located northeast of Mont-Laurier and approximately 3.5 hours from Montreal. Upon our arrival, we were greeted by Benoit Chevalier (Director of operations), who quickly had us settled into our accommodations. We were lodged in a stunning lakeside rustic cottage, which was made up of 4 individual bedrooms, each with its own en-suite bathroom. The cottage was spacious and featured all the sought after amenities, including Wi-Fi. It was evident why Beauregard Lodge has a 5 star rating based on our cottage alone, which also offered a spectacular view of the lake. Beauregard Lodge features 12 cottages that can accommodate 24-48 person(s) and it sits on an enormous playground of more than 140 square kilometres boasting more than 40 lakes. The Beauregard Lodge does offer the traditional outfitter type packages of hunting and fishing. 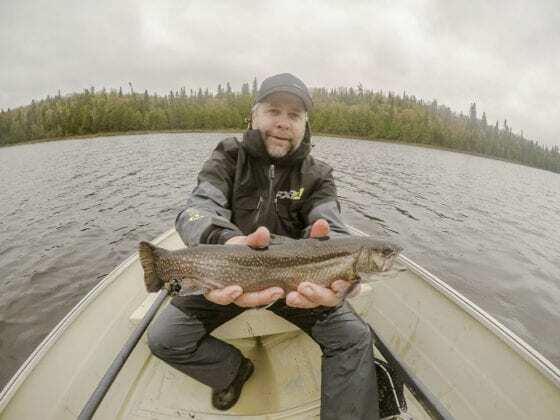 Anglers can enjoy fishing for speckled trout, lake trout, Northern pike or walleye on various lakes while hunters, on the other hand, will appreciate the challenge of possibly harvesting a black bear on several baited sites that are spread across the vast territory of the Beauregard Lodge. The Beauregard Lodge also offers the possibility of hosting corporate events and also family and social gatherings with a vast variety of activities. 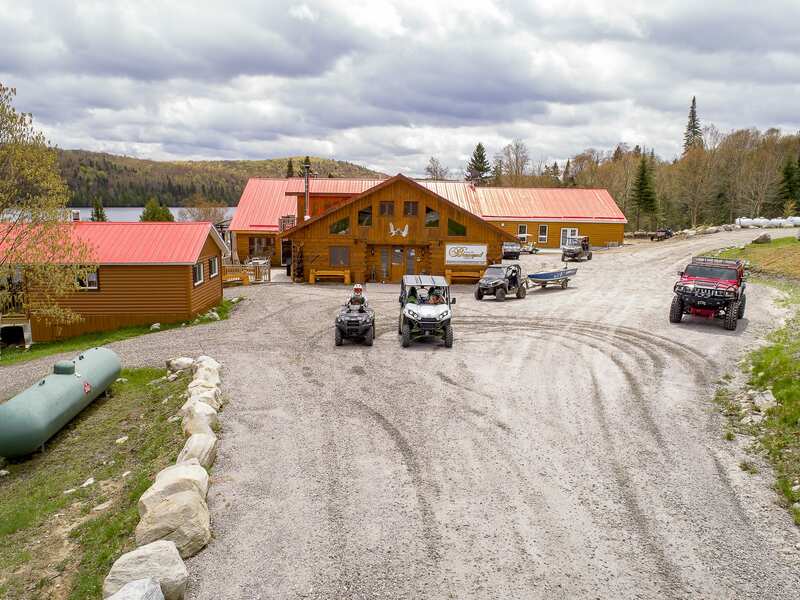 The Beauregard Lodge does, of course, welcome off-roaders with an overnight stay. The Beauregard Lodge offers a wide variety of activities and packages, something for everyone’s taste and budget. For more information on the Beauregard Lodge, we invite you to visit their website. Once we unloaded our Kawasaki units and had our gear all stowed in our cottage, we meet up once again with Benoit. Over cocktails and a most gratifying meal, Benoit helped us with the logistics of the next few days. The main lodge and dinning room are also set in a rustic décor providing for a relaxing dinning experience. The food is excellently prepared by a gourmet chef; we knew that our taste buds would be in for a treat over the next few days. The next day, we awoke to a chilly and severely overcast morning. It was evident that Mother Nature would not cooperate with us on this day. This type of weather conditions isn’t ideal for taking photos and shooting video, as the images captured seem lifeless and bland. Due to this, it was decided over breakfast that we would try our luck at some speckled trout fishing as we waited for the weather to improve. 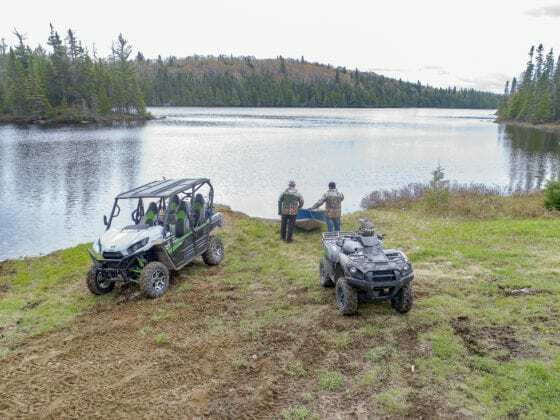 We loaded our gear onto the 2017 Kawasaki Teryx4 LE and Bruteforce 750 SE and hit the trails for a short trail ride to a nearby lake that Benoit had recommended. 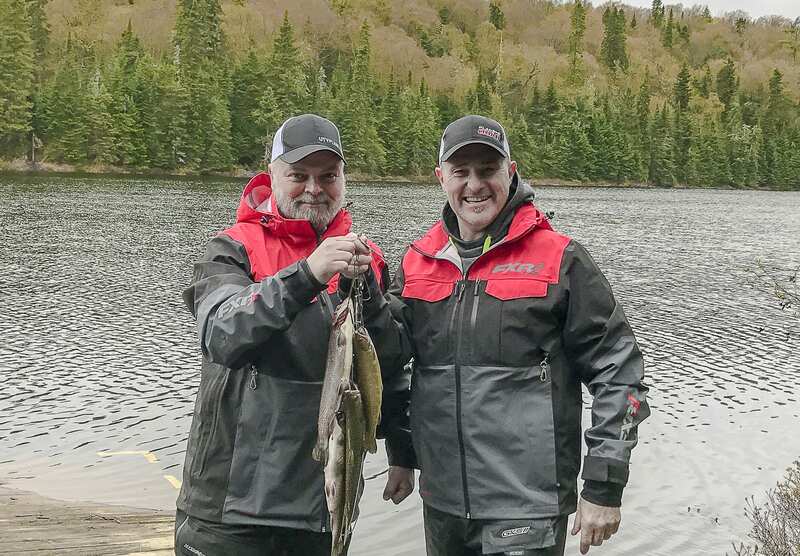 Upon our arrival at the lake, we loaded our rods, tackle and gear on the boat equipped with an electric outboard engine that prepared for us by the Beauregard Lodge staff. We used a very basic line setup that consisted of a Lake Clear Wabbler with 18-inch leader/hook and worm as bait. There are countless setups used for trout fishing, however, this basic setup has always produced good results for me. We spent the next few hours fishing and easily obtaining our quota of speckled trout. The trout were of nice size (10-12 inch) and very aggressive that morning, providing for some great fishing moments. For me, there is nothing better than killing a few hours fishing with some great friends in a tranquil almost picturesque setting. Unfortunately, the weather had not improved and rain was now upon us. We decided to head back to the lodge for a quick lunch and plan the rest of our afternoon. After way too much food, we decided that the rest of the day would be spent riding the trails. We might not be able to produce footage, but we surely could get to know our units provided to us by Kawasaki Motors Canada. Our 2017 Kawasaki Teryx4 LE was white and green in coloration (Metallic Stardust White) and the unit looked great with its aggressive styled frontend. Entering and exiting the unit is made easy with factory installed doors and the unit has ample room for 4 adults. The unit’s ergonomics are well designed and the instrument cluster provides all the information you need at a glance. The cargo bed area provided us with ample room to carry all the gear we needed for our expedition, plus additional storage was also available in the vehicle. 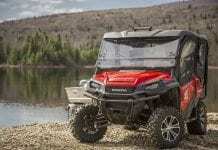 The unit is powered by a 783cc V-twin engine and boasts a sport suspension with Fox Podium 2.0 shocks. 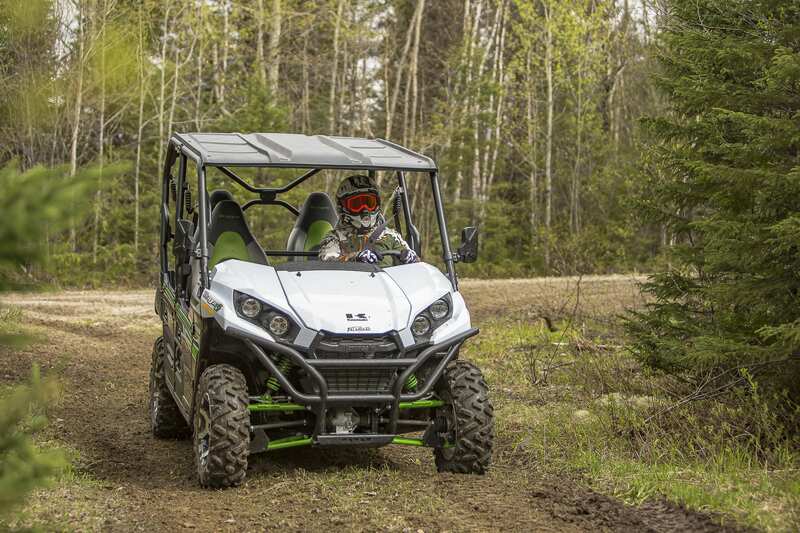 The Kawasaki Teryx4 LE sits on a set of 26” Maxxis Bighorn 2.0 tires mounted on 14” cast aluminum wheels and comes standard with EPS (Electric Power Steering). 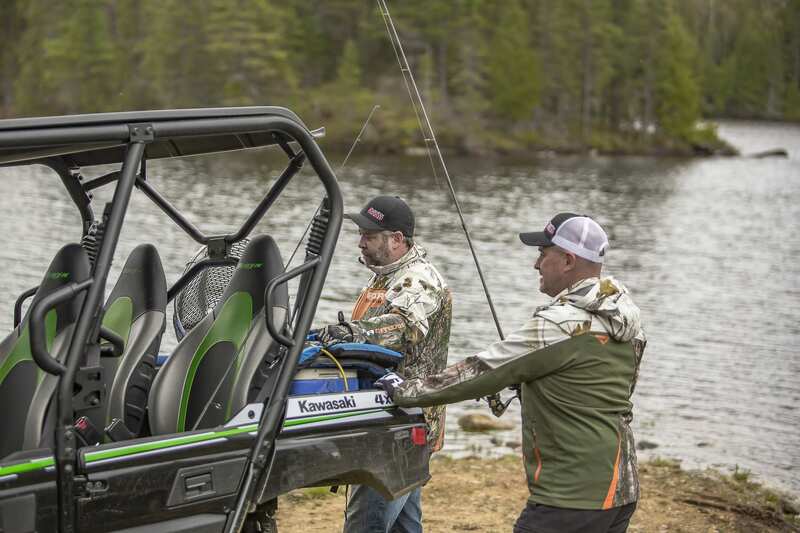 The 2017 Kawasaki Teryx4 is available in 3 models: base, LE and Camo. The private trails surrounding the Beauregard Lodge consist mostly of hard packed surfaces, lose rock and narrow wooded passages. 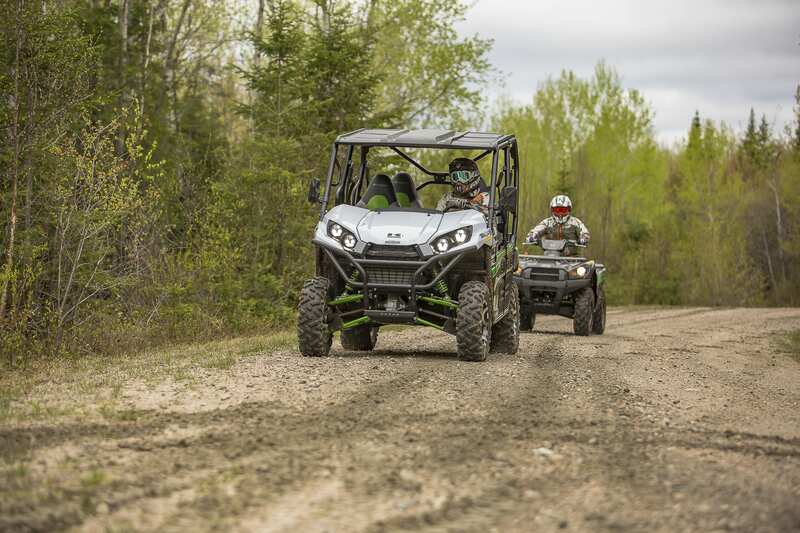 The 2017 Kawasaki Teryx4 LE easily navigated this type of terrain due to its responsive 783cc V-twin engine and the cruising comfort provided by the Fox Podium 2.0 shocks. The narrow tight wooden passages were easily crossed, thanks to precise steering provided by the EPS. The few trail obstacles we did face were effortlessly conquered by the Kawasaki Teryx4 LE due to the 11.2” of ground clearance. 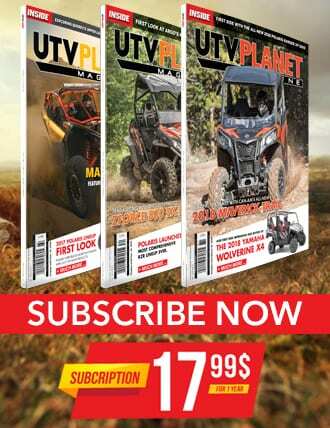 We will be doing an in-depth review of the 2017 Kawasaki Teryx4 LE in our next issue of UTV Planet Magazine. However, what is important to note for now is that the 2017 Kawasaki Teryx4 LE is a pure pleasure to drive and it easily got us and our gear to where we needed to go, all in comfort and style. After a long wet day out on the trails, we made our way back to our cottage for a much needed shower! We regrouped back at the lodge and enjoyed a nice 3-course meal in the serene setting of the Beauregard Lodge dinning room, followed by some adult refreshments. The next morning we awoke to some better weather conditions, not ideal, but the improved light conditions would allow us to shoot our footage. So after a quick hearty breakfast, we hit the trails once again. We spent a good part of the day, till mid-afternoon, riding our Kawasaki units and exploring the scenic backcountry while capturing our footage along the way. Now that our vital footage was captured, and since this is a fishing excursion after all, we decided to try our luck for trout fishing. 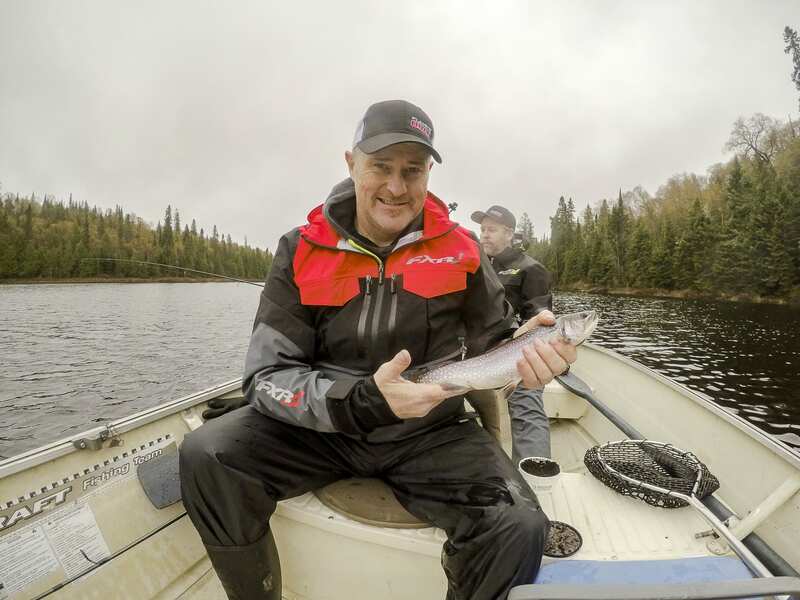 We knew other anglers had success on the lake besides the lodge so we chose to tackle the same body of water. As soon as we made our way out onto the water, Mother Nature decided we had been spoiled enough for that day and sent more rain our way. We trolled the lake for a few hours, but unfortunately for us the lake trout decided not to strike our lures this day. Our last evening was spent yet again enjoying another gourmet meal with great friends and new acquaintances while reminiscing about our adventure at the Beauregard Lodge. It wasn’t a great surprise to get up the next morning and find sunny skies, isn’t that always the case? With us at least it is! Every time we have a shooting or activity planned the weather is miserable until comes time to leave. So under sunny skies, we packed our gear, loaded the units onto our rig, bid farewell to our new friend at Beauregard Lodge and started our long trip back home. Kawasaki Motors Canada for the unit loaners. 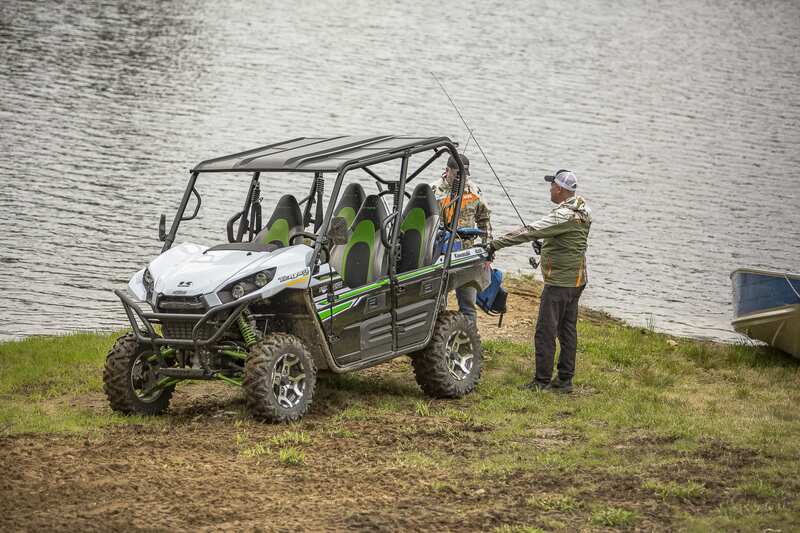 We were impressed by both the 2017 Kawasaki Teryx4 LE and the Bruteforce 750 SE. Both units handled the trail conditions remarkably well and were a pleasure to drive and ride. 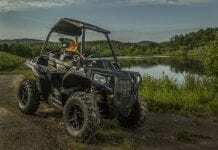 Make sure to check out our next issue for a full in-depth review of the 2017 Kawasaki Teryx4 LE. FXR Racing for keeping us safe on the trails with the helmets and protective gear and for keeping us warm and dry with the FXR outdoor clothing line-up.